For most embroidery enthusiasts/lovers, they deeply know good quality stabilizer is a vital key for a good embroidery design, especially for those who ever had bad embroidery experiences caused by using poor quality stabilizer. New Brothread is dedicated to provide premium cut away embroidery stabilizers for delicate fabrics. 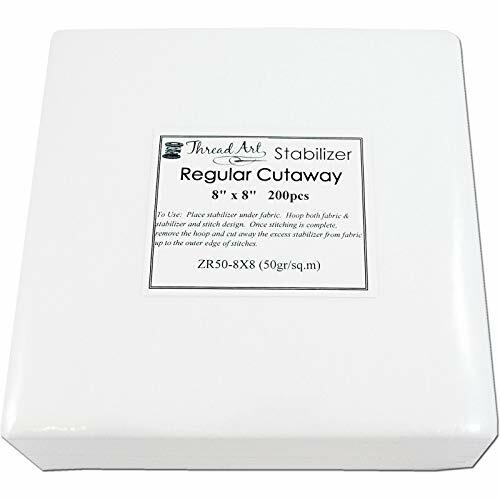 Tearaway embroidery stabilizers are temporary stabilizer that can be torn away easily and clean in either horizontal or vertical directions around the stitches. Tearaway embroidery stabilizers are recommended for using with medium to heavy weight fabrics and dense embroidery designs. Tearaway embroidery stabilizers are stable and be able to withstand repeated perforations. Great backing choices for most embroiderers. TEMPORARY STABILIZER: It provides temporary support for embroidery projects. They are best used on firmly woven fabrics and fabrics made from natural fibers. Our tear away embroidery stabilizer can be torn away easily yet provides adequate stability. WIDE APPLICATIONS: Best used on natural fibers, thicker and softer fabrics. Great for hoop embroidery, applique, thread stretching, computerized lace embroidery and decorative stitch sewing. SKIN-FRIENDLY MATERIAL: 100% first-class Polyester which is acid and lead free! No any itching worries even you use our tear away embroidery stabilizer on your skin-touch clothes. EASY TO USE: Hoop the tear away embroidery stabilizer, stick the fabric to the stabilizer, then stitch. After finishing your project, just tear the stabilizer away easily and clean in either horizontal or vertical directions around the stitches. MEDIUM WEIGHT FOR ALL THE STITCH DENSITY (COUNTS): It is medium weight 1.8 oz (50 Grams) tear away embroidery stabilizer for light to medium stitch density, for much denser designs, you can use more than one layer. Brand: H.B.I. | Manufacturer: H.B.I. 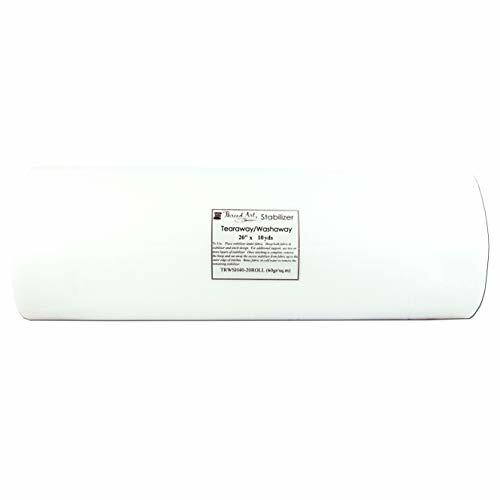 Temporary stabilizer that can be torn away easily and clean in either horizontal or vertical directions around the stitches. Recommended for using with medium to heavy weight fabrics and dense embroidery designs. Great backing choices for most embroiderers. Embroidery Stabilizer - Provide excellent stability through the stitching process, and they can be torn away easily. 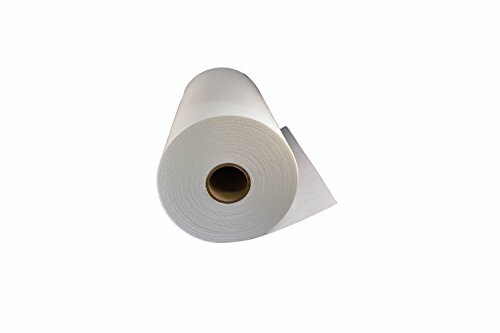 Large Roll - 10 x 100 yards in a roll, abundant roll of stabilizer for your use on machine embroidery and hand sewing! Premium Polyester Material - Made of food grade premium polyester material, the product is 100% skin friendly, No itching worries even uing on your skin-touch clothes! Medium weight 1.8 oz - it is medium weight tear away stabilizer which can be used with medium to heavy woven fabrics such as denim, canvas, corduroy, duck cloth, dill and twill. What you get: 1 X 10 * 100 yards high quality tear away embroidery stabilizer; 30 days Hassle - Free return and replacement; Lifelong friendly Customer Service. One of the most important elements in producing perfect results is choosing the right needles, thread or pattern and its no different when you embroider with a high performance stabilizer paper for your sewing designs or projects. The accessories you choose can make a huge difference to your design results. This superior quality 12"x50 yard roll of medium weight backing is perfect for many sizes of hoops and comes in a convenient 50 yard roll. Our stabilizers, unlike similar products, provide extra stabilization for the fabrics and materials you choose and are able to withstand the repeated perforations of any sewing project. As a result there's no slipping or puckering. Your stitches are smooth and even. Sewartsy high performance stabilizer backing tears easily and cleanly in either direction with minimal effort and without distorting the embroidery project. Our stabilizer backing is perfect for projects such as jackets, woven materials with light to medium stitch counts as well as denims, linens, and broadcloth. It is heavy enough to keep embroidery from puckering on t-shirts and it's an excellent alternative to other forms of backing. If you're trying to decide on quality embroidery supplies and you value your finished product, you'll want to use our stabilizers. That's where Sew Artsy comes in! You won't be disappointed. NO RISK WARRANTY. We stand behind our product with our 30 Day Money Back Guarantee so you have nothing to lose! 20" x 10 yd roll of Tearaway Washaway embroidery stabilizer. 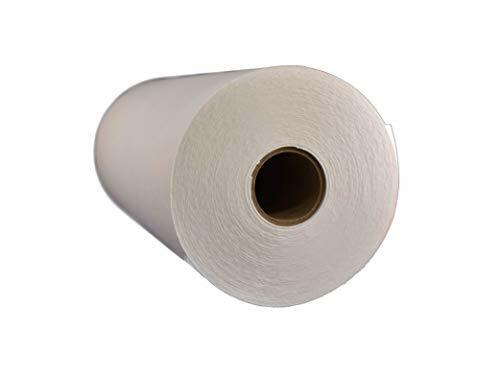 A great choice when you need a water soluble stabilizer that is still a non-woven style. Has all the properties of regular tearaway plus dissolves easily in warm tap water. Very easy to use. Simply hoop the tear away embroidery stabilizer together with the fabric, then stitch. After finishing your project, tear the excess stabilizer close to the stitches. Use warm water to remove the rest of the stabilizer leaving only your finished design. 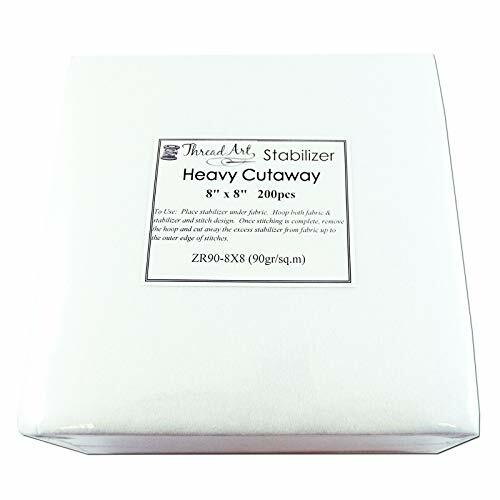 This embroidery stabilizer is a medium weight 2.1 oz (60 grams) tearaway washaway which is perfect for most stitch density projects. Dissolves easily in warm water after embroidering. 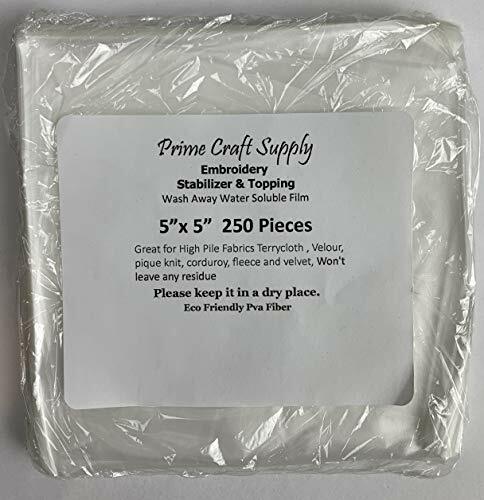 250 Pre Cut Sheets - 5" x 5" Wash Away Water Soluble Film Embroidery Stabilizer & Topping. 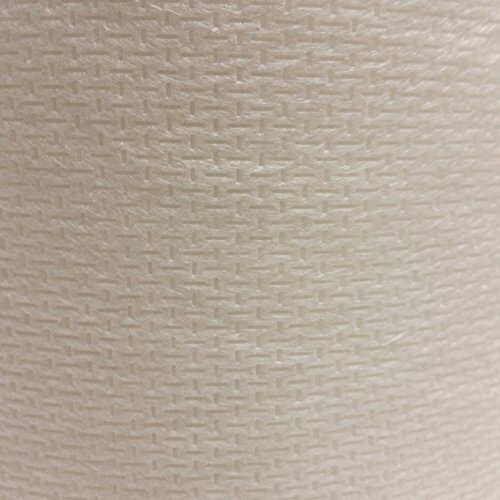 It's industrial strength provides stability on embroidery, prevents wrinkles and slips, lowers cost of labor, and is made of eco-friendly PVA Fiber. When to use Embroidery Stabilizer & Topping: Stabilizer film is used as a fixer in course of delicate embroidery. Great for High Pile Fabrics like towels, terry cloth, waffle, velour, pique knit, corduroy, fleece, and velvet. Dissolves in both hot and cold water. When to use Embroidery Stabilizer & Topping: Stabilizer film is used as a fixer in the case of delicate embroidery. Great for High Pile Fabrics like towels, terry cloth. ater won't leave any residue. Lightweight and Embossed, 20 Micron 0.8 Mil. Perfectly Fits Embroidery Hoops for Tajima and 12cm (5 inches round). Use more than one sheet to cover large designs. No need to waste time cutting the roll stabilizers. How to use: Stabilizer Film is placed on the top of the product to get process stability. Ironing is not required and there is no glue or bond on the stabilizer. Just loop over the fabric before embroidery. Removes easily like a non-woven stabilizer. Spray water or wash your project if you're not able to tear away leftovers. Water Soluble Film leaves no trace on products, and dissolves naturally underneath the embroidery after the first washing. 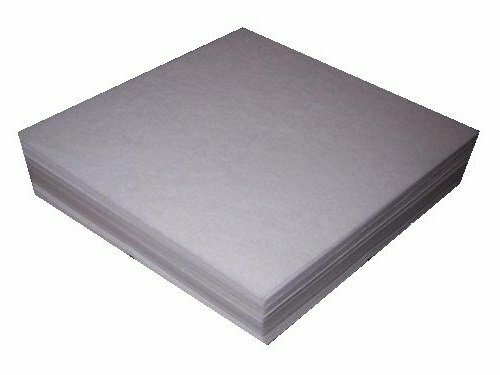 200, 8" x 8" sheets of all purpose heavy weight cutaway works well with high density or large designs, delicate and stretchy fabrics and high stitch counts. Use this stabilizer for those hard to stitch complicated projects. 3.2 oz (90 grams). Perfect for both home and commercial embroidery machines. Several sizes to choose from. 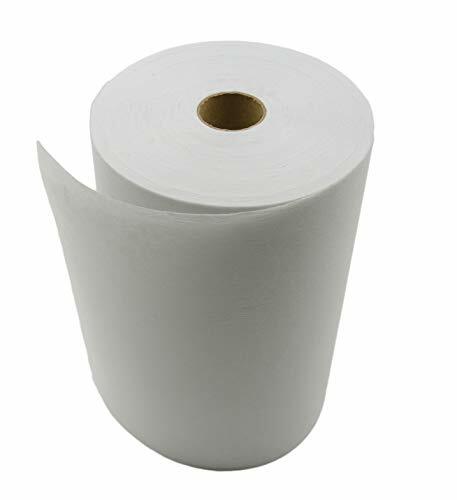 Nonwoven, soft 100% polyester. The stabilizer is a soft non-directional, non-woven cutaway. 200 8" x 8" sheets of all purpose heavy weight cutaway stabilizer works well with medium to high density and large designs, delicate and stretchy fabrics. 3.2 oz (90 grams). This stabilizer is a heavy weight 3.2 oz (90 grams) cut away which is perfect for high stitch density projects. 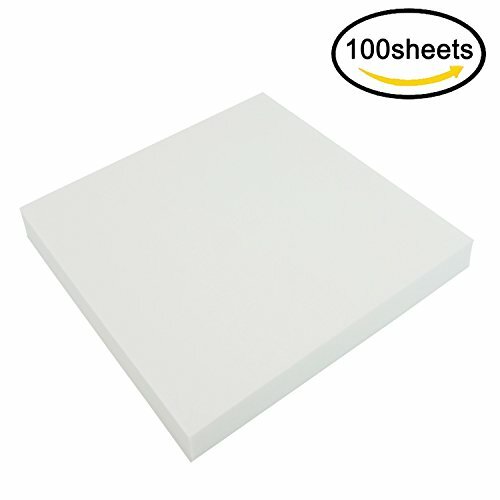 200, 8" x 8" sheets of all purpose medium weight cutaway works well with high density or large designs, delicate and stretchy fabrics. 1.8 oz (50 grams). Perfect for both home and commercial embroidery machines. Several sizes to choose from. Nonwoven, soft 100% polyester. The stabilizer is a soft non-directional, non-woven cutaway. 200 8" x 8" sheets of all purpose medium weight cutaway stabilizer works well with medium to high density and large designs, delicate and stretchy fabrics. 1.8 oz (50 grams). This stabilizer is a medium weight 1.8 oz (50 grams) cut away which is perfect for most stitch density projects. For extra stability and performance for very high stitch counts, you can you can use more than one layer. 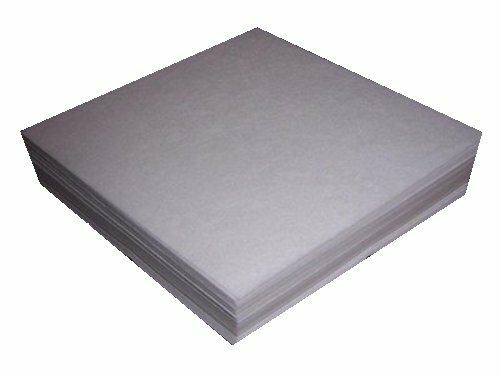 50, 8" x 8" sheets of Sticky Back Tearaway embroidery stabilizer. Great for those hard to hoop projects. 1.5 oz.. Perfect for both home and commercial embroidery machines. Just peel away backing, apply to garment, hoop and stitch. Idea for stretchy fabrics too. 50, 8" x 8" sheets of sticky back tearaway embroidery stabilizer. Great for those hard to hoop projects. Very easy to use. Simply remove paper backing on the stabilizer and stick to the fabric. Hoop the stabilizer together with the fabric, then stitch. After finishing your project, tear away the excess stabilizer close to the stitches for a clean professional look. 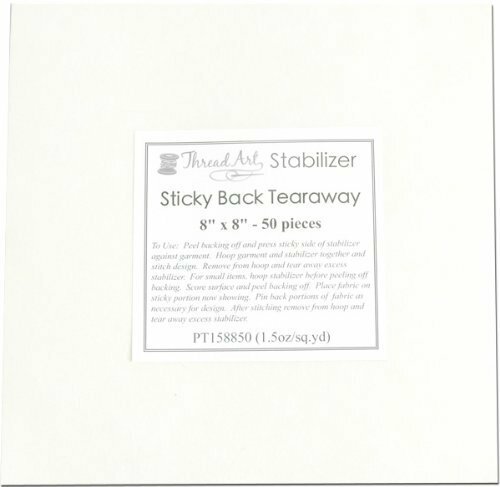 This stabilizer is a medium weight sticky back tearaway embroidery stabilizer is perfect for most stitch density projects and hard to hoop items.